Stork by Wendy Delsol. Grades 7-10. Candlewick, October 2010. Reviewed from ARC provided by publisher. 355 pages. Katla is a true California girl. She lives for fashion and she hates the cold. So when her parents get divorced and she moves to her mother's hometown in Minnesota, Katla's sure that life's going to be a drag. The town doesn't even have a Starbucks! But soon after Katla arrives in Norse Falls, strange things start happening. She discovers that she's part of an ancient order of magical women, the Stork Society, who guide undecided new souls to their mothers. And Katla meets Jack, a handsome senior to whom she's inexplicably drawn. As Katla gets to know her place among the Storks and gets closer to Jack, she'll figure out the truths that have been hidden from her. - I liked the unusual fantasy lore. Stork is definitely something different from the scores of YA paranormals already on the shelves and that's what led me to pick it up. Parts of the story are inspired by Norse mythology, which is something we don't see a lot. It's refreshing to pick up something new and interesting. The way Ms. Delsol incorporates birds into the story was really cool. - I liked Katla. She's spunky and her obsession with fashion adds some great details to the story. She's also a character that's easy to root for. I felt like the story took a long time to get where it was going. A lot happens in the book and some of it gets tied together at the end, and some of it doesn't. The end felt rushed, with a bunch of things getting neatly tied together in the last 30 pages or so. This wasn't a book I could sit down and read in one sitting. It took me weeks of picking it up and putting it down. I think that's partly because I wasn't completely in the right frame of mind for high-concept fantasy, but I think it's partly because there was a lot going on that didn't seem to be connected until the very end. And, although I liked Katla, her voice wasn't strong enough to carry me through when the plot didn't seem to be going anywhere. So, it wasn't exactly my cup of tea, BUT I sincerely hope that we'll see more from Wendy Delsol and I especially hope we'll see more unique takes on YA fantasy. Vampires and werewolves are fine (I am not on board with the whole angels thing), but it's really nice to see something different. Read more reviews of Stork at 25 Hour Books, I Just Wanna Sit Here and Read, So Many Books, So Little Time, and Dreaming in Books. 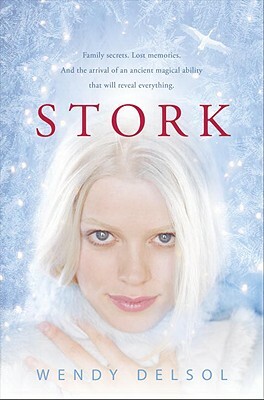 Stork will be on shelves October 12!